A royal first for the Queen. The Queen has made unexpected debut at London Fashion Week, the first time she has visited the event during her 65-year reign. 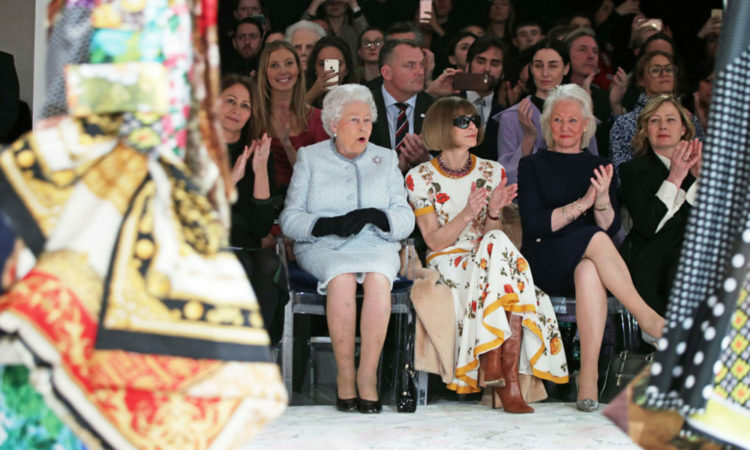 The monarch sat in the coveted front row, next to American Vogue editor Anna Wintour and designer Angela Kelly, who made the elegant duck-egg blue outfit with crystal embellishment worn by The Queen to the show. The trio was seen chatting ahead of the Richard Quinn catwalk show where the Queen later presented the inaugural Queen Elizabeth II Award for British Design. Congratulations to @karen_walker and the Kūki ‘Airani Creative Māmās for representing New Zealand at The Commonwealth Fashion Exchange presentation at Buckingham Palace during London Fashion Week. Hosted by Catherine, Duchess of Cambridge and Sophie, Countess of Wessex the event included over 300 guests in fashion, politics and art and included the likes of Anna Wintour and Naomi Campbell. @karen_walker combined her chic yet eccentric design with the Kūki‘Airani Creative Māmās – lead by 73-year-old Māmā Tukua Turia (pictured left) – to create a one-off strapless gown centred around the traditional Cook Island tivaivai. Earlier in the week, the Duchess of Cambridge showed her support for the fashion industry by co-hosting The Commonwealth Fashion Exchange at Buckingham Palace alongside Sophie Countess of Wessex. In an effort to highlight the power of fashion to unite the Commonwealth in new ways, among the designers present was New Zealand fashion icon Karen Walker. Queen Elizabeth II presents Richard Quinn with the inaugural Queen Elizabeth II Award for British Design alongside Vogue’s Sarah Mower, Caroline Rush, and Angela Kelly. The Duchess of Cambridge chatting to NZ designer Karen Walker. The Duchess of Cambridge with British designer Stella McCartney and American Vogue editor Anna Wintour. This article originally appeared on Nowtolove.